My dear friend, and Children of Mercy contributor, Phil The Tremolo King is planning on hitting the road this autumn in a very peculiar and wonderful fashion. By train. Therefore, as members of a Trainwreck’d Society, we are obligated to support him! He will be documenting the event as he passes through the Southwest with his acoustic guitar and a few friends playing in coffee shops, bars, clubs, etc. This will definitely turn out to be an experience he, and possibly you, will not soon forget. But, he needs our help. If Phil cannot raise $2,000 by September 21st, the entire thing will be thrown into the dust bowl of time and thought, and basically will not happen. That’s where we come in! Phil has started a Kickstarter Page with the hopes and dedication to earn just enough cash to get him across the country, and he needs our help more than ever! And as always with Kickstarter, there are several amazing rewards to be had. Including Phil The Tremolo King’s entire album catalog, DVD’s, tour only CD’s limited edition T-Shirts. acrylic paintings, and maybe even a song written just for you! Plus more! It’s a win win situation. This is your chance to cop yourself some amazing music, and help an artist reach his goal to accomplish something truly incredible! C’mon people. Every dollar counts! Even just one of them! And remember, you do not have to pay right away. You will only pay WHEN (not if, have confidence!) the event is proven to be a success in late September! So let’s do this! “All aboard! “ How many times has this familiar cry beckoned travelers ? It marks the beginning of an adventure by rail ,seeing new places, meeting new people, exploring the vast open spaces of America. What better way for a Belgian immigrant musician like me to tour? Taking inspiration from Woody Guthrie andHarry Partch, I will be traveling 1,995 miles, playing in coffee shops, bars and clubs along the way; me and an acoustic guitar, joined by friends and fellow musicians along the way, playing songs of and by an immigrant musician making his way in America. I will record my travels and travails, sharing with you the breathtaking beauty of wide open spaces, golden sand dunes, mountains, swamps, and bayous of the Southwest . I will share with you the touring life of an independent musician and offer a window into some of the rural towns in that are often passed by. As a child growing up in Belgium, I was fascinated by the American West, its legends and folklore as immortalized in comic books, movies, and National Geographics. Beautiful and forbidding, full of creatures and plants not found anywhere else in the world. A magical, haunting place. It wasn’t until a few years ago that I would actually see it with my own eyes during a short trip from Austin to the Davis Mountains in Texas. It was a very moving and spiritual experience that will stay with me forever. started brainstorming about going on tour …it hit me! Why not tour by train? And why not take in the very place of my oldest fantasies about America, and document the trip? The Amtrak Sunset Limited is perhaps the most legendary of all modern trains. Dating back to 1894 and originally known as the Sunset Route, it takes a southernmost path through the bayous of LA, Texas Hill Country, the Chihuahan desert with its ancient rock formations, the haunting Painted Desert and finally the hills of California and the City of Angels. 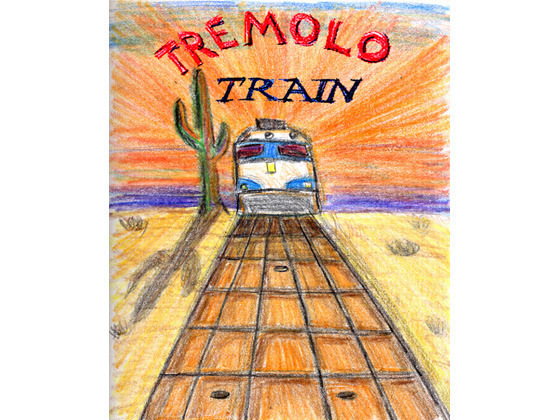 I need YOUR help to make the Tremolo Train Tour a reality. I’ve written a theme song for the tour and am putting together a limited edition CD/cassette of traveling songs for this tour only. That little gem and much more can be yours in exchange for your generous contribution. I will also be giving away original artwork, t shirts, and my collected musical works ( 4 CD’s total recorded in NYC, Austin and New Orleans ) for different contribution levels. Many years ago I immigrated to NYC from Belgium with a back pack and a guitar in pursuit of my dream of playing music. It became the adventure of a lifetime. Eventually I met the woman who would become my wife, and with wife and son I moved to another musically renowned city….New Orleans. We bought a small house which I completely renovated. 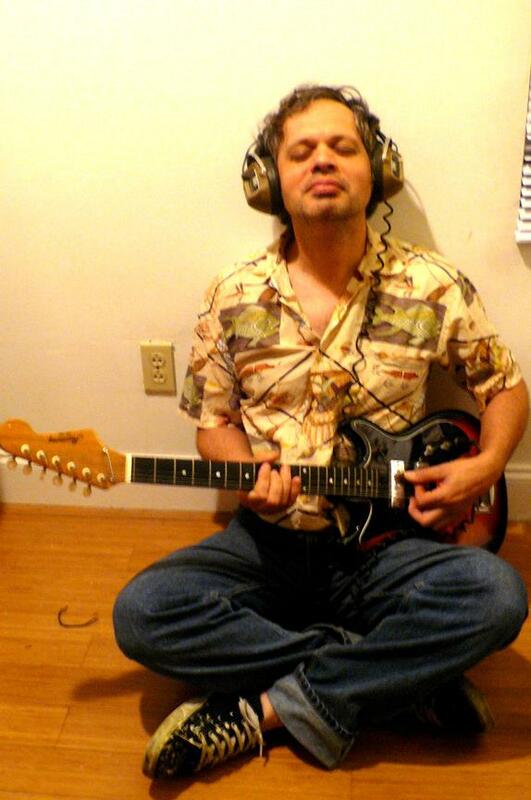 The renovation took up all my time and money but I still managed to write and record songs and made a 5 song EP with the Tremoflex9000 project, featuring Flex Unger and Vic Ruggiero from legendary NYC ska band the Slackers. Then came hurricane Katrina. For the next four years I divided my time between Austin, TX where my wife and son relocated and New Orleans to finish repairs and renovations on our little house. Finally we were able to all move back into our house and start the process of rebuilding our lives. The silver lining was that the upheaval in our lives caused by Katrina inspired many of what I think are my best songs. So I made eleven of my favorite post-K songs into a CD simply called ‘11’. It is available from Norman Records ( UK) , got a really nice review in Drunken Werewolf ( also UK )and is receiving airplay on radio stations and podcasts all over the UK, Spain and the US. I also became involved in Children of Mercy, a compilation CD/ book project by indie musicians from all over the globe to benefit the fight against cystic fibrosis, that received quite a bit of grassroots attention. And so here I am…the Tremolo Train Tour is a big step on the path to realizing a life long dream. But remember…kickstarter is all or nothing! If I don’t raise at least $2000 by September 21 I won’t get a cent! So it’s up to you now. Help me make this dream a reality. And be a part of something truly unique and unforgettable. And you can be sure I will forever be grateful to each and every one who helped make the Tremolo Train Tour a reality! !